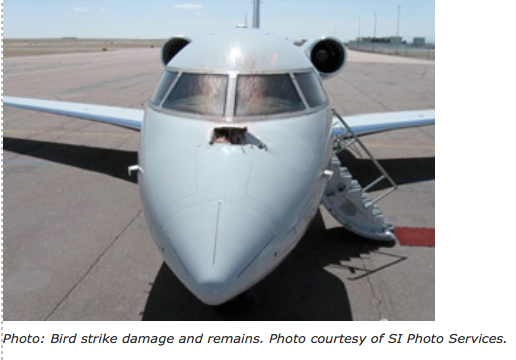 While typically the result is not as catastrophic, birds and other wildlife strikes to aircraft cause over $600 million in damage to U.S. civil and military aviation each year. How can we prevent an eight-pound bird from bringing down a 93,000-pound airplane? To reduce the chances of bird strikes, airport authorities must first know what species are being hit. That’s where the Smithsonian Institution’s Feather Identification Lab comes in. feathers, snarge (smudges on the airplane from where a bird hits and skips off the airplane) and knowledge of what species should be where when. The Hudson River case was one of the largest cases the lab has ever worked. Normally, for a non-damaging bird strike, the lab receives one sample. If that sample is a whole feather, they can probably work the case in an hour, maybe two, including paperwork. For US Airways Flight 1549, the Feather Identification Lab received four shipments containing 69 different bits of evidence-everything from a wipe on a cotton swab to pieces of burnt feathers with dirt and oil to whole feathers that the scientists could take out to its reference collections for comparison. Each item had been carefully collected, preserved and labeled with the location on the airplane where it was found when investigators tore down the engines. While usually the lab aims to identify the species, in this instance it had two additional tasks: to recreate the accident by figuring out the number of birds involved and where they hit; and to uncover whether they were migrant or resident geese. Using whole feather, microstructure and DNA analysis, scientists confirmed Canadian geese were responsible. While they found several non-catastrophic impact points on the wing and tail, they determined that, at a minimum, three Canadian geese had entered the engines, at least one male and one female in one engine and at least one male in the other. Currently, most aircraft, like the Airbus 320 for US Airways Flight 1549, are certified to handle four-pound birds and still maintain their structure. Yet it took two eight-pound birds in one engine and at least one in the other, which was catastrophic for the engine. It’s too early to say how the lab’s findings will affect changes in engine design or airport management. Typically, the species identifications from the lab help airport biologists manage the habitats in ways that discourage wildlife from congregating in the area-and thus reduce opportunities for bird strikes. The exact approach will vary depending on each airfield’s unique situation. But it works. New York’s JFK International Airport, for example, has reduced the number of gull strikes by roughly 80 percent through grass management, elimination of standing water, and pyrotechnics to scare away birds. The key is, once you know the species that could cause problems, you can manage them and prevent future trouble.